In a parcel of just 20×20 meters, a farmer can plant 30 fruit trees. 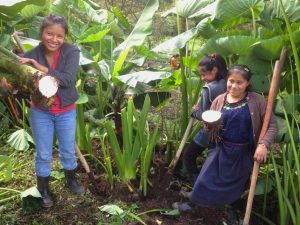 Fruit trees make a huge difference for subsistence farmers along the edge of the cloud forest. These fruit trees were first introduced to these villages by EcoQuetzal more than 20 years ago. CCFC is building on a great idea. Continuing to promote fruit tree husbandry and value adding, as well as offering farmers a better market for their fruit. Pears, plums, peaches, nectarines, and avocados are all great fruit trees well suited for high elevation agriculture. Deciduous fruit is not a labor intensive crop. Once established, a farmer can husband 30 plum / peach trees for a year in just six work days (plus harvest). Thirty trees can produce 6,000 lbs of plums in an average year. (an average of 200 pounds per tree — one farmer from above the village of Sebob got 800 pounds of plums from one tree in an exceptionally good harvest). CCFC is just beginning to address the needs of market access and value adding. CCFC’s Cloud Forest Products processing center will become an important place for adding value to these wonderful crops. If the market doesn’t bottom out and can stay strong through the harvest season, those 6,000 pounds can be sold for approximately $1,600. Corn crops are not profitable on these steep rugged mountains. Mono cropping corn year after year keeps farmers in poverty and impoverishes the soil. Fruit trees on the other hand, are profitable. They are well suited for the cold climate of these high elevation villages that border the cloud forest. Fruit trees don’t impoverish the top soil. Fruit trees can even slowly build the top soil. CCFC sees agroecolgy as a vitally important component in community based conservation. Within the mosaic of agroecology, fruit trees keep coming to the forefront. Today, CCFC promotes the planting, grafting, marketing, value adding and general husbandry of fruit trees in all its programs. A well done graft can make a difference for years to come in yield. Sebastian of Semesche’, Carcha’ shows off grafts that he learned from CCFC director Tara Cahill back in 2005. WALC students become experts in grafting fruit trees. Even the most experienced in grafting have been impressed at the grafting abilities of many WALC students. It also has the multiplier effect that someone that has both learned to graft well and has learned to be a leader can multiply her knowledge and skills with her neighbors. Here’s a photo of Juan Cho and her classmate Irma. Every year WALC offers top notch instruction in grafting. Students learn both theory and practice. A grafted fruit tree can produce many time more fruit and better fruit. Farmers with existing trees can take advantage of old, none productive trees. One simple graft onto a 3 or 4 inch trunk can burst into a full size tree in a matter of months. Thanks to a grant from the Disney Worldwide Conservation Fund with Cornell Lab of Ornithology, CCFC was able to provide two grafted fruit trees to each Kids & Birds student in 2015. CCFC interns and volunteer taught students tree planting techniques and fruit tree husbandry. In some cases CCFC interns and volunteer accompanied the students back to their homes to witness the tree planting. Kids & Birds students learning about fruit trees. Start small, think big. Here is a statement that works both for planting fruit trees and for education. It’s not just the tree that gets planted. It’s the ideas, the dreams, the vision. Maria Elena of Chicacnab, San Juan Chamelco takes her tree up the steep muddy road to her home in the clouds. Plum trees grow great in Chicacnab and Maria Elena is eager to get her tree planted. Peaches improve both family nutrition as well as family income. In 2010 a CCFC service learning group from a high school in Chambersburg, PA visited the village of Sanimtaca. The visiting school planted a small orchard of a variety of fruit trees for the village primary school. Here’s a little photo of one of the trees they planted with a student from that school holding her plastic cup (a regular feature of snack time). Here’s that same tree (far right) in July 2016. Fruit trees, the gift that keeps on giving.